HomeWelcome to Pro-Tech Consultants Home Inspections in Newton MA! Welcome to Pro-Tech Consultants Home Inspections in Newton MA! First Unitarian Society in Newton. “Newton can be a wonderful place to live with so much to offer! Rich in history yet vibrant with life and activities of today! But you don’t need us to tell you that for you have already driven or walked about and got a sense of what makes Newton the place you want to live. For your benefit we have provided further information that you may find helpful”. The Massachusetts city of Newton is located in Middlesex County on the south bank of the Charles River, about 8 miles northwest of the state capital of Boston. The city is comprised of 13 “villages,” each with its own distinct character and many containing their own small downtown areas. One of these (Chestnut Hill) is home to Boston College (BC). In addition to Boston, Newton is also bordered by Wellesley (to the west), Needham (to the southwest), Waltham (to the north), and Brookline (to the east). Known as the Garden City, Newton was settled in 1630 as part of Cambridge (whose original name was “Newtowne”). In 1688, Newton separated from Cambridge and became known as Cambridge Village and later Newtown before finally becoming Newton in 1766. The establishment of Boston and Worcester Railroad depots in 1834 fostered Newton’s growth as a suburb of Boston. Incorporated as a city in 1873, Newton today is known as a regional education center. 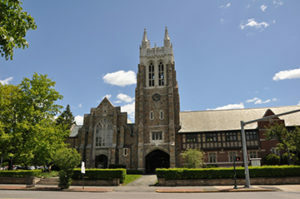 In addition to Boston College, the city is also home to Andover Newton Theological School, Mount Ida College, and Pine Manor College. Major industries in the city include publishing, computer technology, and manufacturing of precision instruments and chemicals. The city is also the birthplace of the Fig Newton. Attractive to visitors and residents alike, Newton is a vibrant college community enjoying a close proximity to the Boston metropolitan area. The city is also rich in arts and culture, featuring two symphony orchestras, a large state-of-the-art public library, resident theatre groups and many artistic treasures. The Newton History Museum at the Jackson Homestead, built in 1809 as a farmhouse, served for a period of time as a stop on the Underground Railroad and is now a museum filled with paintings, manuscripts, photographs, maps and numerous historical artifacts. The New Repertory Theatre and Newton Country Players are local theater groups, and Broadway musicals are regularly performed at the Turtle Lane Playhouse. From July through October the city hosts a popular outdoor Farmer’s Market. Median gross rent in 2015: $1,824.